In its latest disinformation seeking US withdrawal from Syria, Russia has declared that the Rukban area — where an estimated 50,000 displaced Syrians have been trapped since 2015 — is an American “concentration camp”. In fact, the displaced are threatened by an Assad regime cutoff of a main route and refusal to allow aid, compounded by Jordan’s closure of the nearby border. Rukban, a barren desert area, is within a 55-km (34-mile) US exclusion zone around its Tanf base near the Iraq border, set up to deter pro-Assad attacks. But both the US and the UK have balked at providing assistance in a challenge to Moscow as well as the regime. Russia and the regime have pursued a PR campaign for months to force an American departure and end to its support for Kurdish factions. A US withdrawal — which Donald Trump has favored but which has been blocked by the Pentagon — would enable the regime to pursue its goal of regaining Kurdish-controlled areas in northern and eastern Syria. Moscow says that the displaced, who fled Islamic State attacks from 2015, can return to home areas. However, many fear detentions and forced conscription and are uncertain about the status of their property. The effective Assad regime siege was imposed this autumn with the blocking of the road used by Bedouin traders. The UN, whose last aid delivery was in January, was prevented from making any deliveries until a single convoy was allowed earlier this month. The UN says thousands are at risk from lack of food, medicine, and supplies. Medical staff say at least 14 people have died in recent weeks because adequate care could not be provided. Such a situation in which the camp finds itself reminds concentration camps of the Second World War, which seemed to be long gone. How is it possible in the modern world? Why are the official structures of the United Nations responsible for providing all-round assistance to refugees, in fact, are not active and persistent in resolving global humanitarian issues related to the terrible situation of Syrian citizens in the Rukban camp? 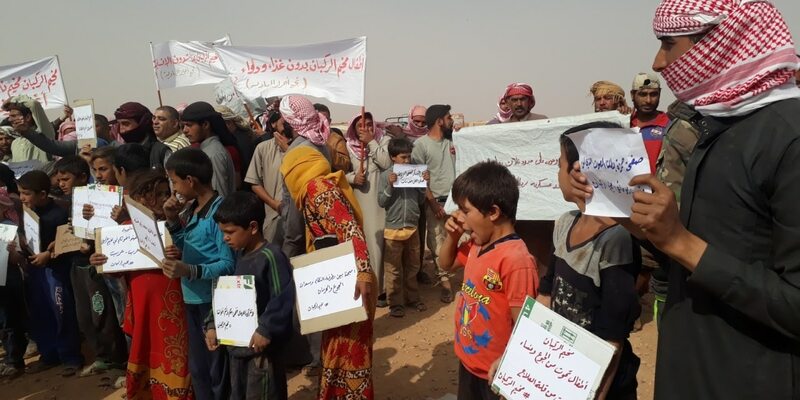 The statement indicated that talks between Jordan, Russia, and the US for the removal of Rukban’s residents, with many going to opposition-held northwest Syria, have not advanced. The situation around Rukban is very complicated.As you know, there’s a deconfliction zone. There are a number of different forces operating there. Following an attack by pro-Assad forces, rebels have warned that Iran is trying to break up a demilitarized zone — declared by Russia and Turkey in mid-September — around opposition-held territory in northwest Syria. Last week pro-Assad units assaulted a position of the Jaish al-Izza faction in northern Hama Province, with unconfirmed reports claiming 22 fatalities. Jaish al-Izza responded to the assault, regained its ground and firing on an Assad regime checkpoint. The jihadist bloc Hay’at Tahrir al-Sham also said it carried out retaliatory attacks. Pro-Assad forces have also periodically shelled the periphery of the zone, causing civilian casualties and bringing retaliatory fire from rebels. But Russia has pushed back the regime’s attempts to suspend the zone, saying that Turkey is continuing to act in good faith to maintain the ceasefire.